Creates a new instrument. 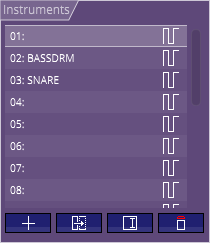 A menu will appear, asking for which type of instrument you want to create. Duplicates the selected instrument into another one. Use this to rename the selected instrument. This clears an instrument. Note that it only clears its data, it does not delete it and shifts all the other instruments.